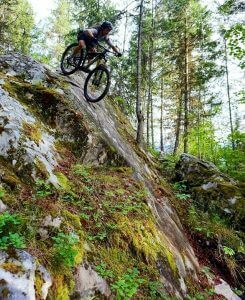 Join us, Shred Sisters, for our annual Co-ed Mountain Biking Retreat in the pristine Golden, British Columbia from September 14th to 17th. The perfect way to wrap up your season, meet some new friends, and enjoy yourself, this retreat offers something a little different than our others. Our coaches Audrey Duval and Jessica Pyper will help you push your limits riding through some of the most engaging trails in and around Golden while simultaneously helping you gain more confidence on your bike. This weekend is focused on helping you take your current skillset to the next level—allowing you to become a more confident and strong rider. As always, our focus is in bringing like-minded individuals together in an encouraging environment to help you meet new friends, gain new skills, and utilize the right tools to keep your body strong and healthy. Also offered alongside our biking excursions will be skilfully crafted yoga sessions that target the areas used most when mountain biking. Our weekend retreat, All Things Golden, is a weekend to remember and enjoy. Healthy and delicious meals for the duration of your stay from Golden Catered. *please note this retreat is suitable for Level 2 and 3 riders, if you have any questions please reach out to us! For any additional information or to register, contact: info@shredsisters.ca or 403-688-1055. Our schedule is not strict; we want to maximize your enjoyment so we have allowed for plenty of time for you to relax off your mat and bike. We have free time available for you to indulge in a book in the beautiful luxury mountain home at Kicking Horse, relax in the private outdoor hot tub, jump on your bike and keep riding, or even schedule a massage. This retreat is a little different than some of our others in that it is a co-ed retreat available to both men and women, so this is a great weekend getaway for couples or for anyone who has a riding partner that might be interested in trying out a retreat! Do you have someone that is interested in yoga, delicious food, and relaxation in a stunning mountain setting but isn’t sure about the mountain biking portion? We have a yoga only option as well, just email us! Our retreats always have limited space, as we have made it our mission to keep a 1:6 instructor to student ratio to maximize the attention you receive, so please register early! Our small instructor to student ratio helps us help you, and allows for you to get the most out of our retreats. Upon registering, you will receive a package via email with a skills questionnaire and a few questions regarding food preference. We cannot wait to share the beauty and excitement that Golden has to offer with you! The retreat was amazing! The coaches were extremely knowledgeable and down to earth. I went in terrified of descents and struggling with climbs and I came out as the one that would go down the hills first and knowing the proper position for me and my bike to make climbing easier. All of the girls that attended as well as the coaches were extremely supportive and encouraging. Every skill level was accepted even if you’ve never ridden a mountain bike before. Overall 15 out of 10!!!! 5 stars ladies!!!!! The Kick Start Mountain Bike Retreat with Shred Sisters was a great way to try out some new mountain biking trails in a spectacular location, while learning more skills and meeting other women who love the sport. They did a wonderful job of adding to my skill set and boosting my confidence on the trail and the apres yoga was a nice complement to the program. 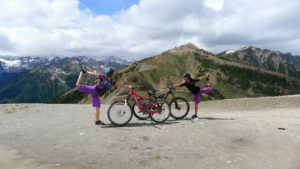 Kudos to Shred Sisters for sharing their knowledge and infectious energy and passion for mountain biking. All Things Golden was a perfect adventure weekend! Audrey and Jeff are great leaders on and off the bikes and were super accommodating. There were tons of trail options and riding for every level rider. I was able to do everything advertised in the retreat and I couldn’t have asked for more: epic bike rides, customized bike-specific yoga, great food and wine, massage to unwind, and a day to cool off in Cedar Lakes!! Worth every penny.